The design of our conical copper ferrules is optimised to ensure ease of use, minimise the likelihood of issues occurring during lifting and offer the best durability when combined with stainless steel wire rope. Like the other ferrules we sell, you can buy custom conical ferrules on our site. 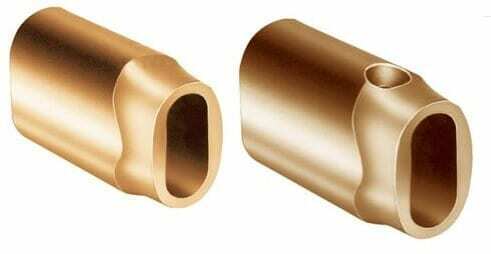 The conical shape of these copper ferrules is an advantage in a number of lifting applications. Safety can sometimes be a concern, especially if there is the potential for the load to snag. However, if the ferrule has this conical design, it will travel more smoothly and avoid a litany of potential hazards. Choosing a conical ferrule fashioned from copper is sensible if you have your sights set on using a stainless steel wire rope, as mentioned in the introduction. This is because these two metals do not suffer the same electro-chemical corrosion issues that afflict aluminium ferrules . If the rope is exposed to the elements for long periods, this is something to consider. Even with the conical shape, these copper ferrules are still custom made and pressed using the latest equipment to ensure that your expectations of strength are met. If you have other concerns about corrosion and abrasion-resistance, then it is a good idea to check out our carbon steel ferrules, which will be even tougher. We are ready and able to guide you through the process of choosing the perfect copper conical ferrules. Call the Rope Services Direct team on 01384 78004 or fire across a question via our site to get a reply in a jiffy. Ferrule Size Fill Factor (f=0.40-0.50) Fibre core Fill Factor (f=0.50-0.60) Steel core Dies Marked Diameter after pressing Straight length after pressing approx. Conical Copper Ferrules Overall rating: 5 out of 5 based on 6 reviews.